Our master bedroom was in dire need of decor updating. When we moved into our house 2.5 years ago, I was 39 weeks pregnant with Robin. Needless to say, it was chaos for the first few months and now, over two years later, we are still slowly getting each room organized and decorated. With a new baby on the way, I was quite motivated to start crossing some projects off the list, including hanging more art and, in particular, more family photos. 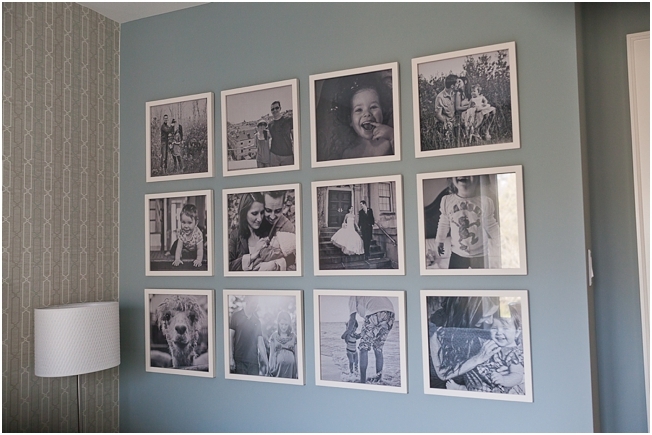 This gallery was a great way to fill up an empty wall, giving our room a more modern feel and satisfying my need to have more photography on display (even if my husband Kyle and I are the only ones to see it!). Project Costs: This will vary depending on your frames and prints. I spent approximately $375 on 12 white frames and twelve 12×12 prints. – 12 frames (matte removed). I purchased mine online from West Elm. 13″ Sqaure white gallery frames. – 12 to 14 prints to fit frames (I suggest having a few extras to see what looks best on the wall). 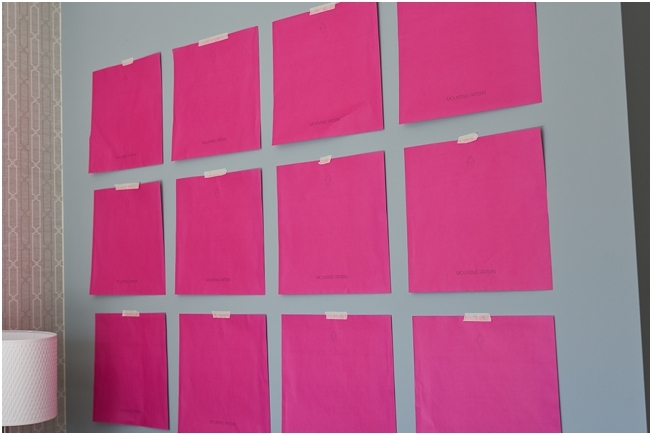 Step 1: Create a “mock” version of your gallery on the wall using paper cut out in the same size as your frames. My frames each came with a template to use for this, which also included a marking to indicate where the hook on the back of the frame is located. If yours did not, you can easily create your own templates using paper and scissors. Step 2: When satisfied with layout, use measuring tape and ruler to determine appropriate spacing between frames. I measured the wall and found the centre point and decided on a 2-inch space between the frames. Starting with the top row, I positioned the first two “mock” frames 2 inches apart with the centre of the wall in between. I worked outwards from there adding the mock frames on either side and below. Step 3: The fun part! Expend some energy and hammer those nails into the wall, using the template as a guideline for where to place nails. If your frames did not come with a template and you had to create your own, measure the frame to determine how far down from the top of the frame to place each nail. Step 4: Remove paper templates and hang frames. 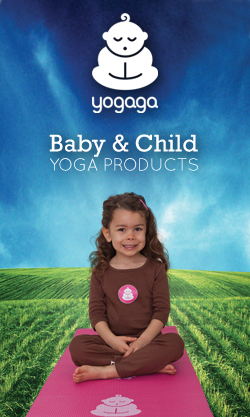 It may take some adjusting to come up with the best layout for your photos. A before & after shot. We’ve also added wallpaper to the back wall and swapped out the chandelier for a fan. Progress, my friends, progress….